We are now 6 days into December and I'm sitting here wondering what happened to November. 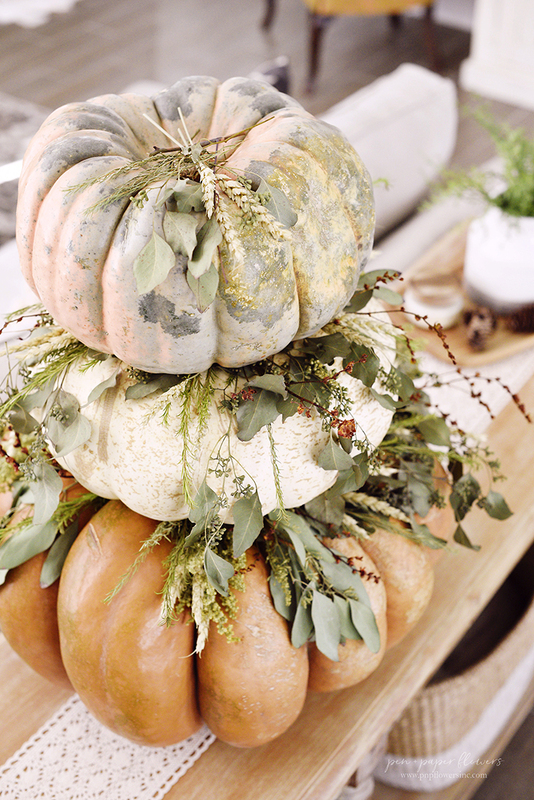 What happened to these beautiful pumpkins? I actually have a love-hate relationship with the month of November. and wretched at the same time. 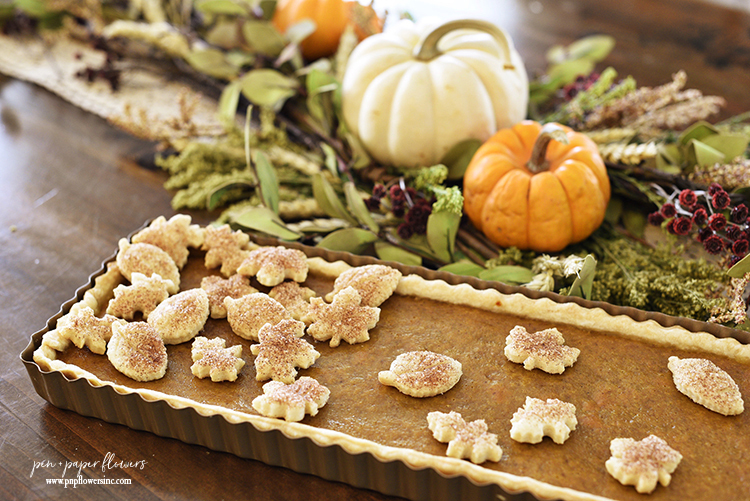 and gobble them up. (pun intended). Instead, I find myself strategically going from one celebration to the next. 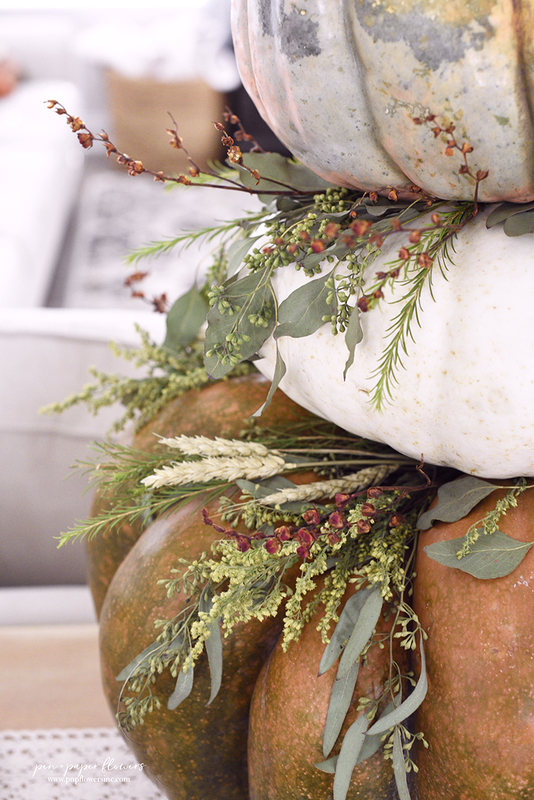 There is no time to soak it all in or gobble it up. 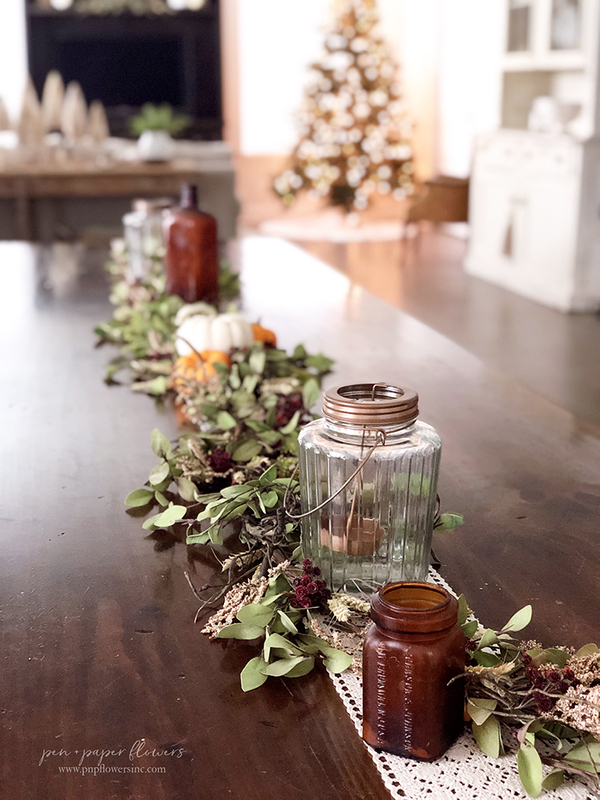 and despite the Christmas festivities and the decor that swooped down upon us all as soon as the last slice of pumpkin pie was dished out...I am taking the time to celebrate the touches of fall I was able to enjoy when Autumn visited...even if was for just a second. 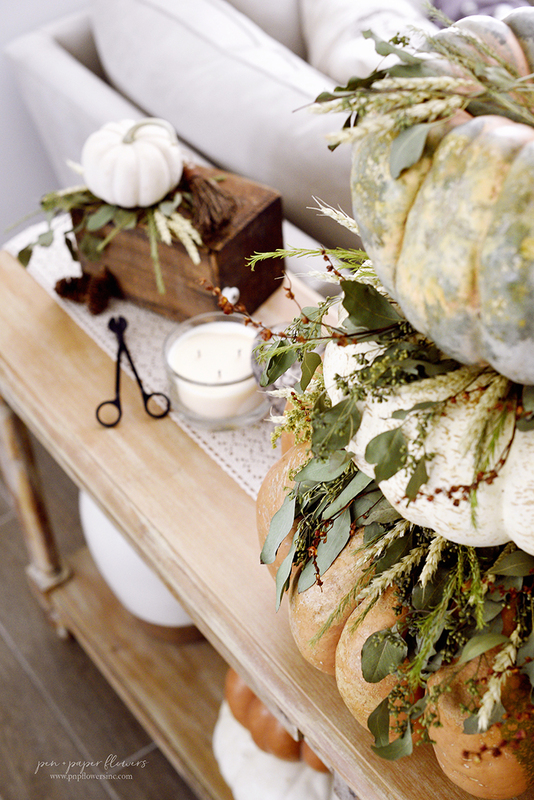 Our table behind the couch was decorated with a giant "pumpkin cake" - which essentially means I created a stack of pumpkins to resemble layers in a cake and then added beautiful fresh + dried florals to the layers. It was inspired by Erin's pumpkin cake over at Cottonstem. 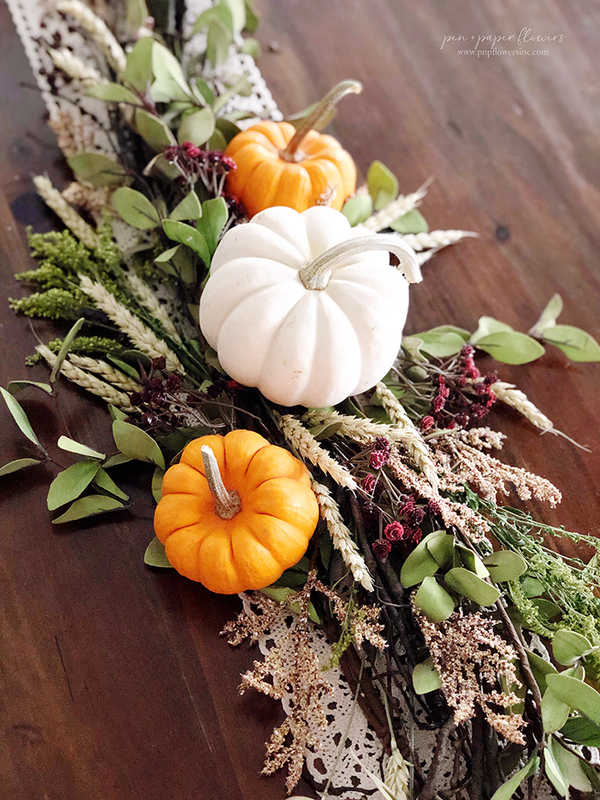 Ours are considerably different as far as the florals are concerned but I just realized when I went to grab the link to her site that I ended up using the same color scheme of pumpkins - in the exact same order. I was also excited to try my hand at baking pie in a different way...using a different pan. If you follow me on Instagram you know I attempted my first "slab pie" - which was my original plan for Thanksgiving dessert this year. (i was testing out my skills early...I realize...but I was excited). When it came right down to it though, we had a smaller scale, more intimate Thanksgiving at my house this year. 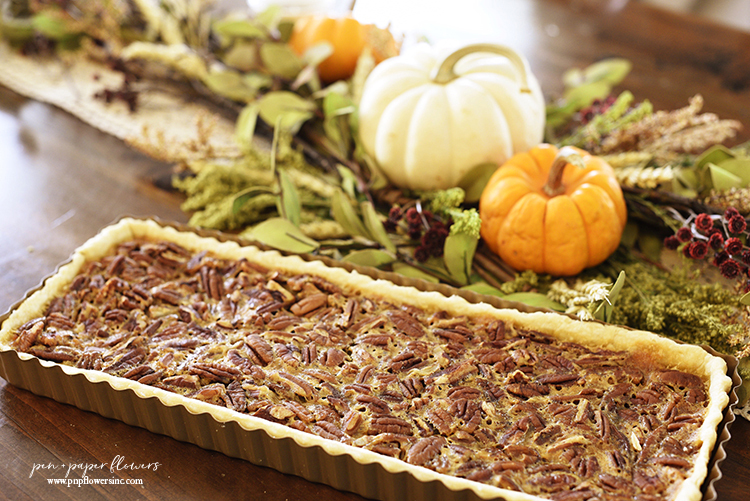 So I scaled back the desserts by doing a couple of "Mini Slab Pies" - the pumpkin one above and this mini pecan slab pie below. They are smaller versions of our classic pie recipes...using only half the amount of pie filling you would normally use for regular pie-plate pie. I highly recommend that you buy THESE PANS to make your next pie. They are relatively inexpensive - especially compared to my favorite pie plate! To put it into perspective, I bought three pans for the same price as one pie plate. And they create a beautiful scalloped crust! I absolutely love them! 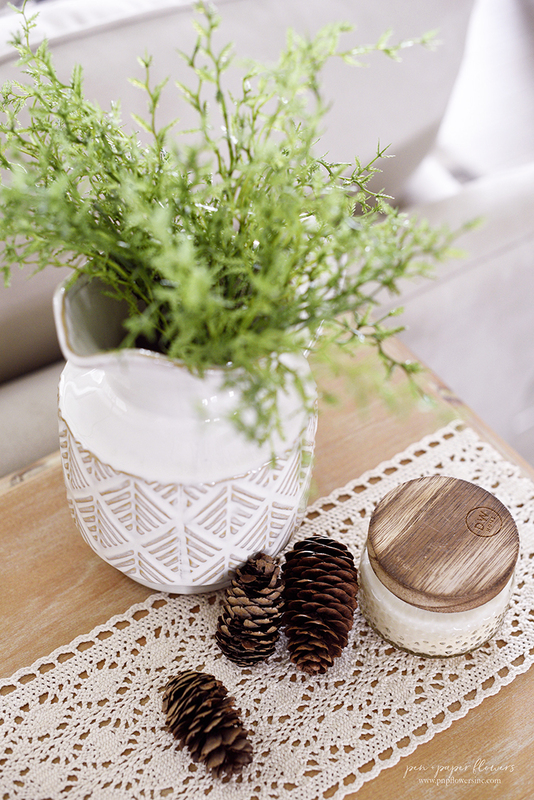 I also added a few small pinecones which I always think adds a charming rustic touch to fall decor. 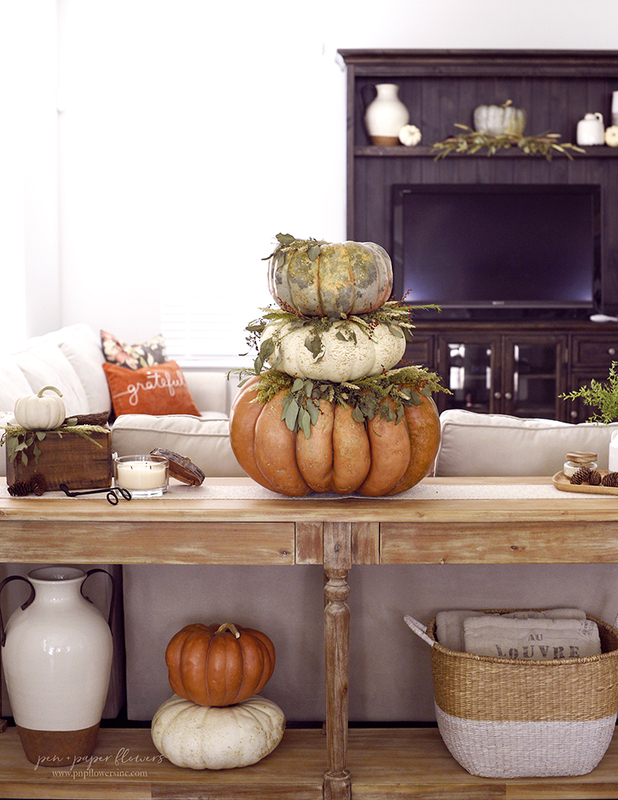 Truth be told though, my favorite part of my fall decor was the "pumpkin cake". It was sitting on this table for a bit but then about 5 days before Thanksgiving, I moved it to the front porch for the rest of the world to see. She sat right outside our door and greeted family and friends as they poured into our home for Thanksgiving Day. I really wish I would have photographed her sitting on the porch, along with the pumpkins and other front porch decor. All I have is video from Instagram when I shared it. Are you following me over there? If not, you are missing LOTS of behind the scenes. 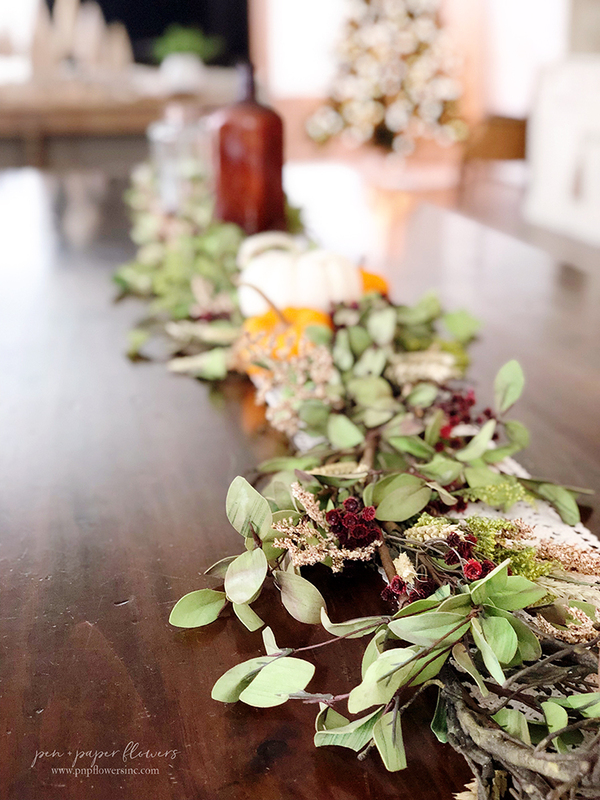 I shared the how-to on this table garland I created for our Thanksgiving dinner table...on my Instagram stories. 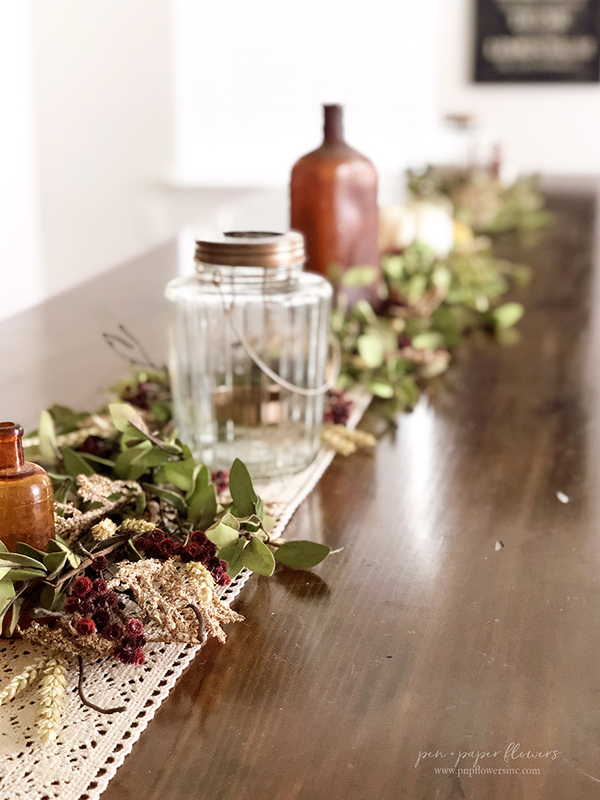 There are a few things I absolutely adore about this table garland. 1. It's really skinny and doesn't take up a lot of space for plates, glasses and food. 2. 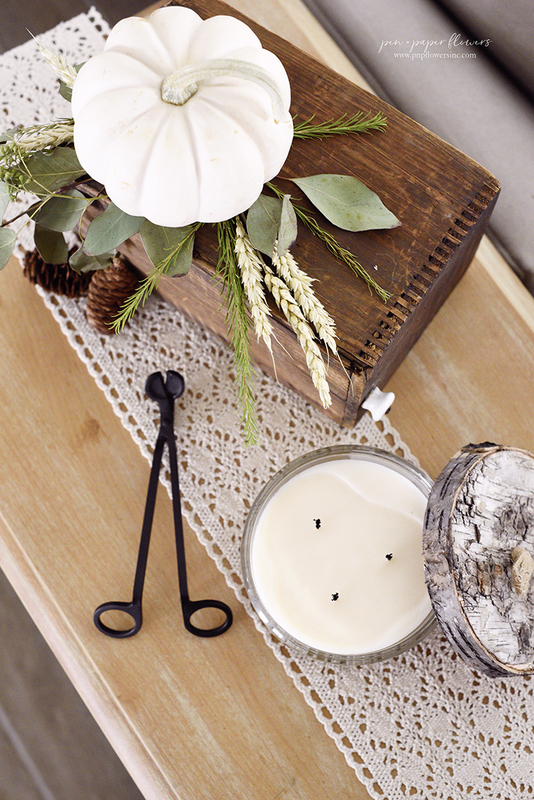 It's a mix of a faux and fresh florals and greenery - along with some more dried wheat. 3. I intentionally created it to flow right into Christmas...I'll tell you more about that in a minute. Yes! That is my Christmas tree in the background. I know!!! Honestly, it had been up since September when I was photographing product for Hershey. I almost took it down but then changed my mind...and here's why. I figured November was so busy with birthdays and Thanksgiving I just really craved for a more simple December. 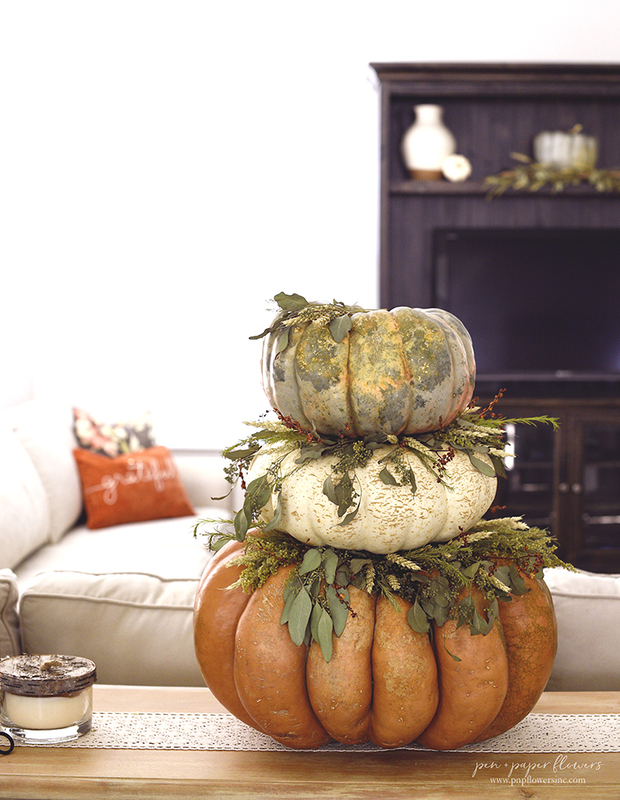 One of the ways to achieve that was to decorate EARLY so when it actually arrived, I could enjoy it. So yes...the house was a mix of Thanksgiving and Christmas. Thanksgiving on the front porch and dining table. I think I'm going to stick with that theory from here on out. I love Christmas tree lights and the peace they fill my home with - always have. If it wasn't weird, I would leave it up year-round. Ha! I chose a green faux garland as my anchor so-to-speak. I selected something that didn't lean toward any specific holiday so that it was more versatile. 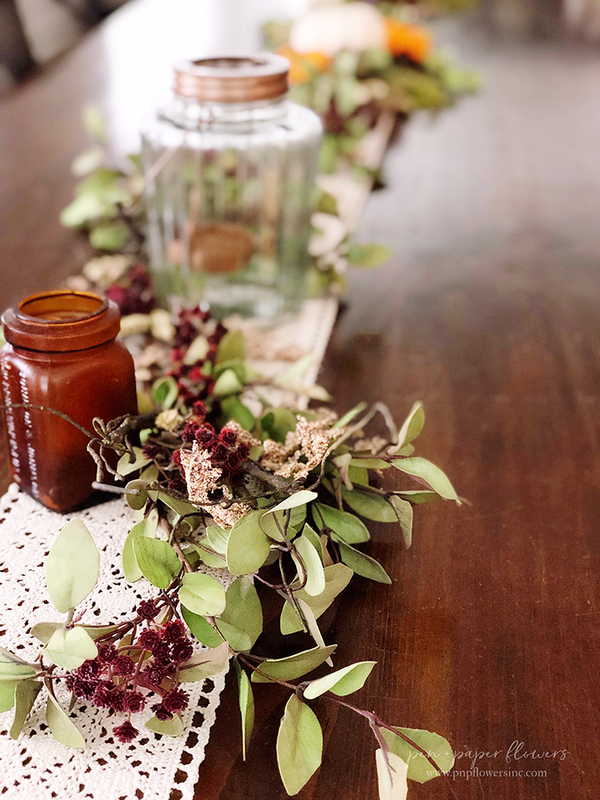 I then chose some "rusty red" faux florals - which works for both Thanksgiving and Christmas. I added some faux creamy/beige "wheat-like" florals along with some dried wheat. I then added some fresh greenery I picked up from Trader Joe's. all I had to do was pull the dried wheat to get rid of the fall vibe. I'll be sharing the Christmas version of it soon. I hope you don't mind me taking a minute to reflect back on November. It did my soul some good to take a minute a look back on it all. Friends! I am making a dream of mine happen today. I'm hopping on a plane to visit Waco, TX - to soak in everything Magnolia.